For several years, I have been immersed in the subject of wool as a wartime resource. The global trade in wool grew exponentially in the 19th century, fed by the opening of new regions to sheep farming, the industrialization of the production of wool yarns and textiles, and the seemingly continuous need to clothe armies and navies around the world in wool uniforms, and bed them down in wool blankets, between the Crimean and Korean wars. It can be easy to lose sight of the personal impact of war amongst the countless samples of textiles manufactured for military purposes, and the rows of uniforms made from them, found in many museum collections focused on military history. It takes the small object, the singular object, to bring one down to earth with a thud – each one of those millions of yards of cloth meant a life at risk, a family in distress, the possibility of mourning as a legacy of war. This small banner is one such object. 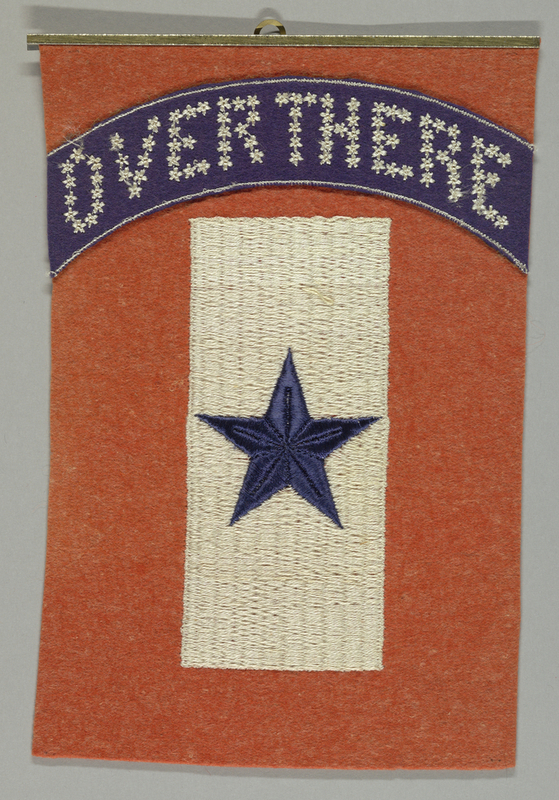 “Over There”, it proclaims, in patriotic red, white, and blue. Machine embroidered in cotton thread on a wool ground, it was probably one of many made in a factory. Factory- or home-made service flags like this one were displayed in a street-facing window, letting the community know the family had sent a loved one to serve in wartime. The service flag was first used in the United States in 1917, and many styles existed. Some included the words OVER THERE; in this example the letters, arcing across the top of the banner, are formed of small white stars. Each person in the household serving in the military was represented by a blue star. The term “Over There” was a kind of code — the title of a popular song by George M. Cohan, written “on his way into work [on] the morning of April 6, 1917”, the day that the United States entered World War I. The United States was, for the most part, still innocent of the true horrors of trench warfare and unscathed by the massive losses suffered by all the military forces participating in the war in Europe. The war was then in its third year. The Battles of the Somme and Verdun in 1916 had sapped the strength and the morale of the armies that fought them. The words to “Over There” may have seemed arrogant to the weary, depleted, and grieving Allies. But to those staying behind, on the American home front, the arrogance was tinged with anxiety. For too many families, the blue star would be transformed into a gold one, signifying the death of the family member who served. Madelyn Shaw is Curator of the textiles collection at the National Museum of American History, Smithsonian Institution.